Abstract – While the world population is expected to exceed 9 billion by 2050, global crop demand is projected to increase by 100-110%. Demand for food is rising in tandem with a growing population, and accelerated by contaminant diet changes. Agricultural expansion is one of the common ways to meet this increasing food demand but it is also a major global driver of deforestation. With increasing world market integration, demand for new land is likely to be concentrated in tropical developing nations that have large areas of land suitable for agriculture. However, these are also areas in the early stages of forest transition and that have high conservation importance. In the face of these rising pressures, spatially explicit predictions of future demand for agricultural land could play a critical role in guiding conservation efforts to conserve key biodiversity areas. Many forests have so far been spared due to inaccessibility, possibly due to lack of infrastructure and political and economic constraints on investment. For instance, recent political and economic liberalization in Myanmar is expected to remove some of these constraints and lead to increased investment into agriculture and thus increased risk of deforestation. In order to protect Myanmar’s rich biodiversity, we urgently need to predict areas at highest risk of deforestation with a view to designing a robust network of protected areas. 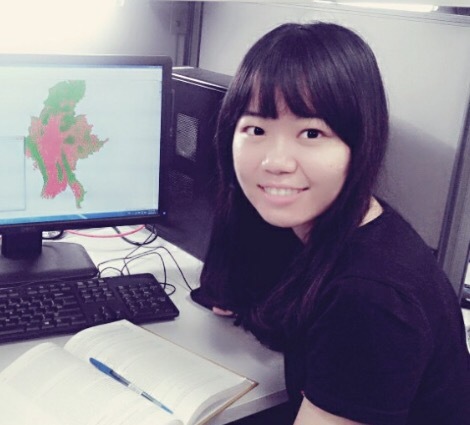 Therefore, Myanmar could be used as a case study to model cropland expansion and its effects on biodiversity before modelling global cropland expansion and its environmental impacts. I thus aim to 1) investigate how cropland in Myanmar would expand after political and economic reforms and its influence on the Key Biodiversity Areas; 2) project how global cropland would expand temporally and spatially and examine its biodiversity consequences; 3) map spatially-explicit global conservation economic cost based on forgone agricultural rent; 4) prioritize human-centered global conservation resource allocation facing increasing food demand and projected cropland expansion. Abstract – Southeast Asian peatswamp forests are wetland ecosystems created and maintained by the interaction of vegetation and hydrology. Extreme habitat conditions such as high acidity, low nutrients and fluctuating water tables have resulted in special adaptations and high levels of endemism in peatswamp biodiversity. The conditions that led to adaptations (i.e. high acidity and low oxygen levels) have also resulted in peatswamps accumulating and storing vast quantities of carbon. While understanding peatswamp biodiversity and carbon storage is still in its early stages, vast areas of peatswamp forests have already been converted or have been designated for conversion to agriculture with the loss of biodiversity and release of vast quantities of carbon into the atmosphere. I aim to reduce uncertainties in our understanding of Southeast Asian peatswamp biodiversity distribution, management and conservation through the following three chapters: 1) quantify drivers of land use change and estimate resultant CO2 emissions, 2) quantify and estimate above ground biomass distribution, 3) prioritize peatswamp areas for conservation and 4) understand the drivers of forest structure in peatswamps.